After training at places like the Edinburgh School of Food and Wine, and the Institute of Optimum Nutrition in the UK, the Kenyan native returned home in 2014 to establish her business. Heather is inspired, creative and passionate about helping you to reach your best health the natural way. If you’re overweight, over-stressed and experiencing poor nutritional balances, nutritional therapy may work for you. It is designed to look at the body as a whole living system, and address health-related challenges through lifestyle and diet changes. Nutritional therapy is also beneficial if you would like support in achieving optimum health. Learn more at nuts about nutrition, and book consultations with Heather at the Karen Surgery in Karen or Power Vibe Studio in Westlands. All nuts about nutrition products are wheat, dairy and sugar free. Most are gluten free, except for the granola which can be made gluten free to order. 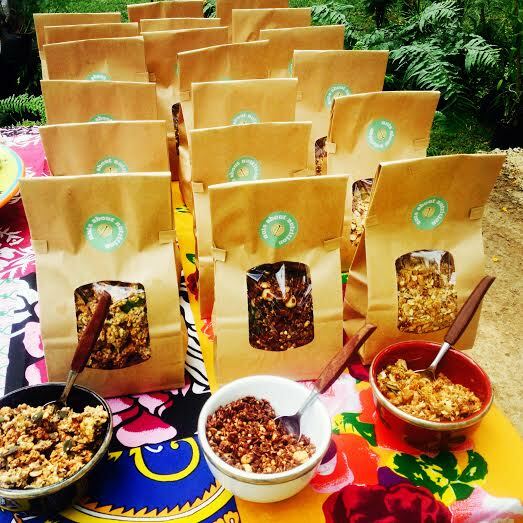 My favourites are the sukuma wiki crisps, gooey brownies, paleo crackers and granola bars. Start with the product bestsellers below, or check out Heather’s full product list.